Today is Secret Recipe Monday! Today’s assignment was for me to find a delicious recipe to share with you from A Spoonful of Thyme. I had a hard time finding a recipe this month because everything sounded wonderful. I had so many pages from A Spoonful of Thyme opened on my page, for days. I debated between the Hassleback Potatoes, Rhubarb Muffins with Almond Streusel Topping and Savory Cheese and Chive Bread, but my heart was calling out to the Chipotle Honey Glazed Chicken. I think I made a great choice!! The chicken is amazing! It’s moist, tender and the sauce, oh don’t get me going on the sauce. It’s sticky sweet with a kick of heat! Hey, that rhymes! lol I loved the glaze so much that I added it to my sweet potatoes! So perfect! I did change the recipe up just a tad bit because my Husband is not a fan of Chipotle. The man can eat hotter the H-E double hockey stick wings, but he doesn’t like chipotle chicken. What the heck? He said it was too spicy for him. He’s crazy! I knew he would say that, so I omitted the olive oil and added freshly squeezed orange juice to tame the heat and I cut back on the chipotle pepper. It had a kick of heat but it wasn’t hot!!! I LOVED it! LOVED it! I am so making this recipe again!! The recipe was super quick and easy to put together, the longest time was letting the glaze rest for 30 minutes, but the rest was quick. Just pop it on the grill, add some glaze and in about 15 minutes, dinner is done. I cooked it with my sweet potato chips. If you haven’t had those, I cut the potato in very thin pieces, and place it on the grill. Flip it in about 2 to 3 minutes, cook for a few minutes more and it’s done! The glaze is so perfect with the sweet potatoes!! I highly recommend checking out A Spoonful of Thyme. I just love her blog! Everything looks so delicious and I think she has a thing for spicy food! You know me and my spice!! 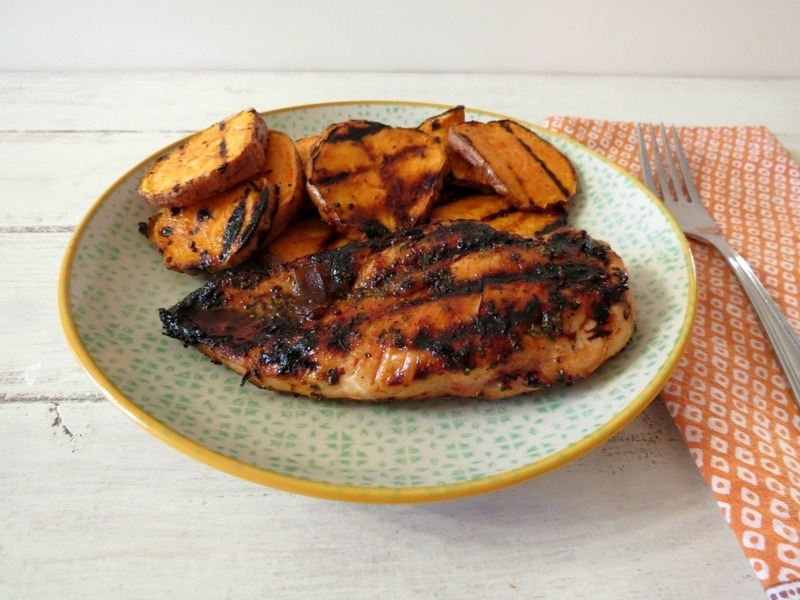 Moist tender, juicy grilled chicken topped with a sweet and spicy honey and orange glaze. Mix the rub ingredients together in a small bowl. Rub it on the chicken breasts; set a side for 30 minutes. To make the glaze, whisk the ingredients together in a small bowl to combine. Allow the glaze to rest for at least thirty minutes. Grill the chicken breasts until golden on both sides. During the last few minutes of cooking, brush the glaze over the chicken, liberally. Remove from the grill and brush with additional glaze. I am so glad I found or should I say was assigned to A Spoonful of Thyme’s blog! It’s simply a wonderful blog so full of different kind of recipes to please everybody! Be sure you check it out and be sure to check out what everyone has made this month in the Secret Recipe Club this month! Have a wonderful day and a great week! Mmm, love it when food has a spicy kick to it. 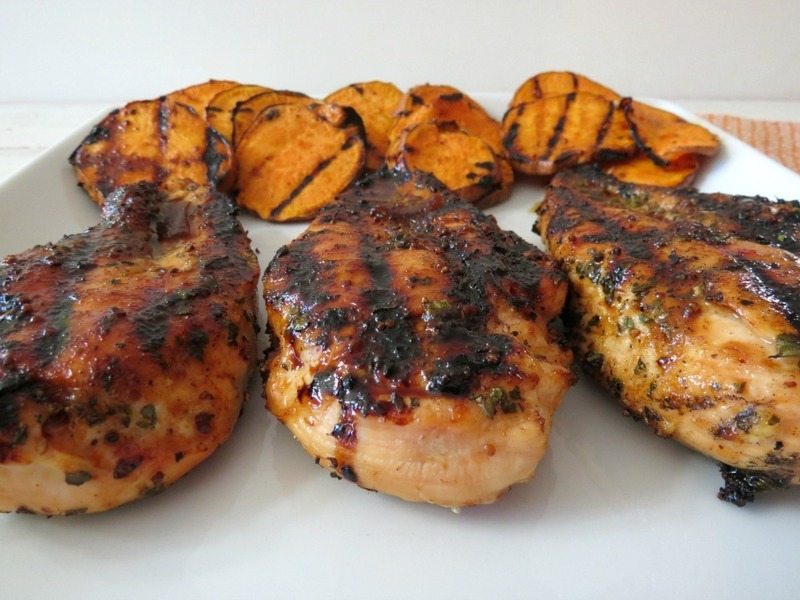 I love really flavorful chicken….this looks so tasty! Question – where do you get chipotle puree? Did you make it yourself? Thanks! Thanks Rebekah for bringing that up, I’ll add it to the recipe. I used canned chipotle in adobo sauce. It’s in the Mexican food section of the grocery store. what a fabulous, flavorful chicken recipe! MMM! I’m so in the mood for grilled chicken after today’s reveal. I need to go out and buy a grill ASAP! Great SRC choice! 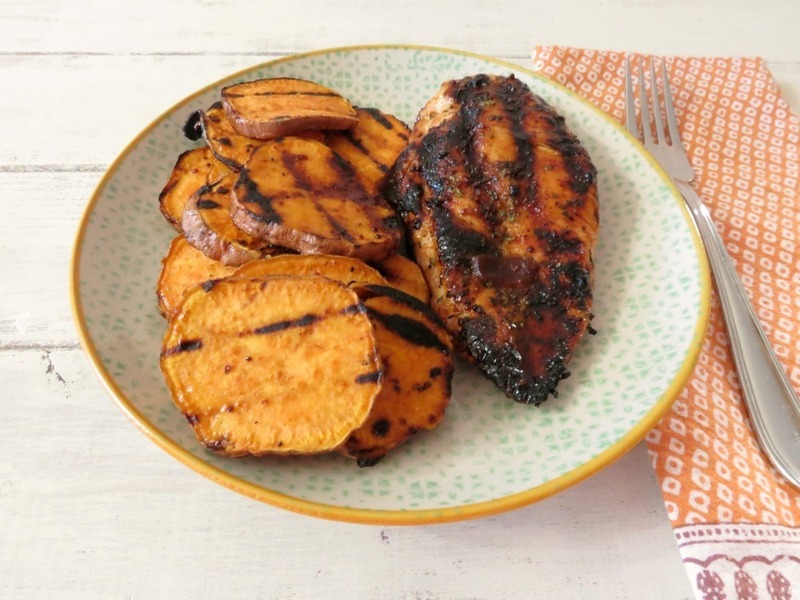 Hooorah, a versatile two-in-one recipe for sweet and spicy chicken AND taters on the grill! We love sweet heat, so this one is a keeper. We are like you, loving sweet heat!! I am so happy that you liked the chicken! We do a lot of grilling and I must admit that this recipe gets a workout! Great SRC selection!! Oh Kate, I loved it! It’s amazing! Such great flavor! I just love your blog!!! Ohhhhhh yum! Sweet and spicy, that is what I’m talking about! We have so many foods in common and you have to love spicy!! I hardly ever grill chicken breasts because they end up so dry. I must give this one a try. And the flavors arre right up my alley. Thanks for posting the recipe and YAY for grilling season. I am so happy for grilling season. I missed it!!! Oh my gosh, that combination of flavors sounds outstanding. We eat a lot of chicken, and that looks like a delicious way to prepare it. Excellent choice! Thanks Shelley! We really enjoyed it!! Your Chipotle Honey Glazed Chicken will be a sure winner here. I just love this combination of flavor. This is a great recipe choice for the SRC. This sounds like a wonderful dinner, I love your adaptations for your husband – we’re sort of puppies when it comes to heat too, so I think your changes would be perfect for us, thanks! This glaze sounds so tasty! I could always use more marinade and glaze ideas for chicken. Oooh, this looks tasty. I just love using honey in a glaze! Thank you Ellie! The honey is perfect in this recipe, makes it thick and sweet! Yum!! Yum! 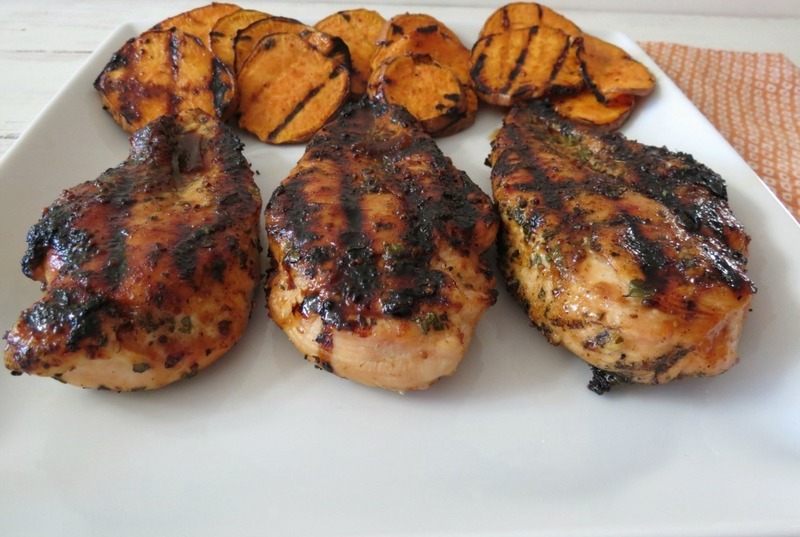 great flavors for grilled chicken. Pinned to try sometime this grill season! Your chicken looks great, and the flavor combo sounds like a win!